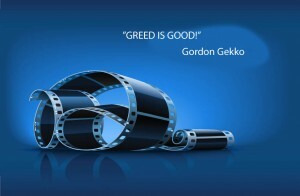 Classical quotes from Wall Street blockbusters and movies taking place in the world of finance. Whether you are looking for naive sayings by the new kid ón the block, Bud Fox, or you want a piece of harsh cynical relity delivered by Gordon Gekko, it´s all here! Peruse the sharp one-liners and infinite wisdom from movies such as Wall Street, Wall Street 2 – Money Never Sleeps, Rogue Trader, Trading Places, Floored, Boiler Room, American Psycho, and To big to fail. Gordon Gekko negotiates with Sir Larry Wildman, Wall Street. Hey, I don’t have all the answers. In life, to be honest, I failed as much as I have succeeded. But I love my wife. I love my life. And I wish you my kind of success.